Does God care about the details of your life—your flat tire, your finances, your health, your relationship issues? Absolutely! And this book proves it. Bruce & Stan’s modern classic God Is in the Small Stuff—and it all matters launched a series of books that sold more than one million copies. Now, 100 of the most inspiring readings from the Small Stuff books have been compiled into one amazing collection! In their lighthearted yet thought-provoking style, Bruce & Stan encourage readers never to disregard the minor, seemingly insignificant things of life—because their infinite God is also intimate. The Best of God Is in the Small Stuff promises encouragement and challenge to readers at all levels of spiritual growth. Bruce & Stan’s God Is in the Small Stuff launched a series of books that sold more than one million copies. Now, 100 of the most inspiring readings from the Small Stuff books—the original and the Marriage, Family, Tough Times, and Christmas follow-ups—have been compiled into one amazing collection! When Bruce Bickel didn’t make the cut as a stand-up comedian, he became a lawyer, which is a career in which he’s considered hilarious. He is active in church ministries and currently serves on the Board of Westmont College. He lives in Central California with his wife, where kids and grandkids surround them. 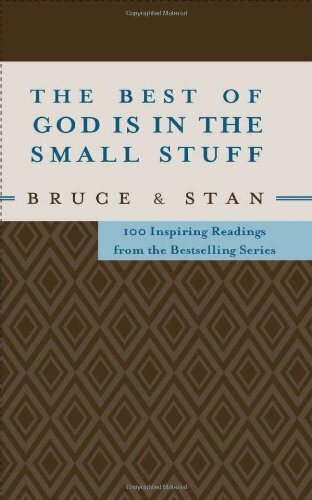 Bruce and Stan have co-authored more than sixty books about the Christian faith, including bestsellers such as God Is in the Small Stuff—and it all matters. They are passionate about presenting the truth of God in a manner that is correct, clear, concise, and casual.